All flying trapeze classes start with a quick warm up and a stretch, followed by our "ground school" lesson, where we teach you the trick you will do on a low practice bar. Then everyone is fitted with a safety harness, and the rest of the class is spent doing the flying trapeze. 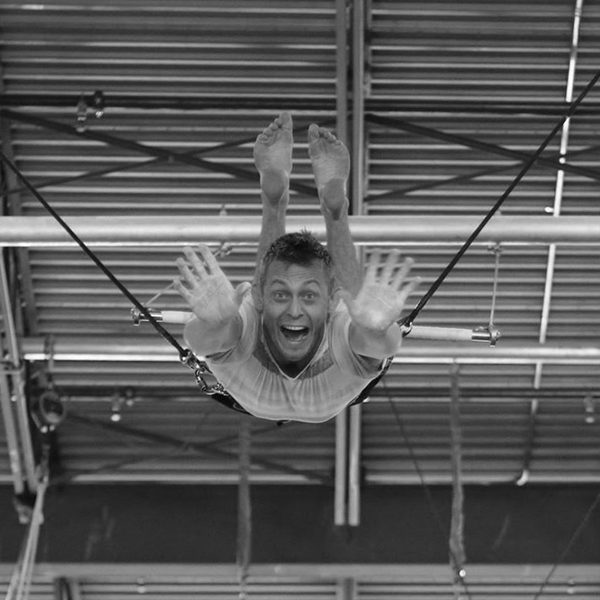 Flying trapeze classes have a minimum of 3 students, and a maximum of 10. We recommend this class for first-time flyers. Tricks & Catching classes start the same as all of our other classes, but end with a round or two (depending on class size) of catching, where everyone who is ready is given the opportunity to do their trick and then be caught and swing with one of our instructors. Students who are not ready to attempt the catch will continue to work on their trick, so they will still get the same amount of turns. Skill Development classes do not have catching. If a student masters their trick before the end of the 2-hour class, we will teach them a new trick. This is a great class for those who want to focus on perfecting a trickier skill that might not be ready for a catch. 3-Month Session - $179/month - Call or email to enrol. 6-Month Session - $174/month - Call or email to enrol.